Yatsushiro SHS was founded in 1896 (Meiji Era 29) and has nearly 37,000 graduates. Its long history and tradition have cultivated students’ sincerity, independence, and broad-minded spirits. Our school characteristics, cultivated by BUN-BU-RYOU-DOU(students are making efforts in both academics and sports), are full of spirit and have established a deep trust with the community. Following the spirit of KOURYOU (School Motto), our school attaches a great deal of importance to BUN-BU-RYOU-DOU. Every staff member is dedicated to educating the students to make it a life habit and challenges the students to adapt a rich sense of humanity and develop their ability to contribute to society. To achieve this, we develop partnerships with families, the alumni association, and our community. We have fulfilling educational activities and aim to develop students to thrive in an international community as well as cultivate students who can pass the entrance exam. In this camp, students use English all day and develop their practical communication skills by participating in a wide range of activities and worshops. Students improve their English skills to participate actively in global society by debating an issue in English. All students take Eiken test in principle, which leads to their success on entrance exams. Students make their own TANKYU-RONBUN, a research paper, during the period of Integrated Study. Yatsushiro SHS is an academic school. More than 100 students have gone on to National and public universities for 30 years on end. Our school started a new program for middle and high school students, so the number of students who can receive admission to elite national universities is increasing and we are achieving very satisfactory results. In addition, two students entered the medical faculties in 2015 and we are establishing our position as a base school. We have some lessons according to the students’ request. For example, a class for the students who take exams for prestigious universities, or national and public universities like Kumamoto University. We all support students to achieve their goals through our school programs. We invite university professors for the purpose of delivering lectures. It is a wonderful chance to listen to a university lecture without leaving our school. Moreover, almost all the students join the open campus of a university and students have time to visit universities while their school trip. We have many far-sighted programs like these. We aims to give students the fortitude to live and develop socialized skills through their own independent decisions and voluntary participation in an activity. Student Council (JICHIKAI) plays an important role in helping to to carry out our school events. Especially, in one of the biggest school events, HOU-SUI-SAI (Sports and cultural festival) students take care of most of the programs. Students are living a spontaneous school life under a school-wide spirit of independence. Many students are getting involved in volunteer activities such as 24-hour charity programs and local activities to collect money. The number of students who join these activities is increasing year by year and they will surely become community leaders who can contribute greatly to society. Our school is the first combined prefectural Junior and Senior High School and students are learning in the same school buildings together. Through interaction among different ages, we foster a rich sense of humanity. 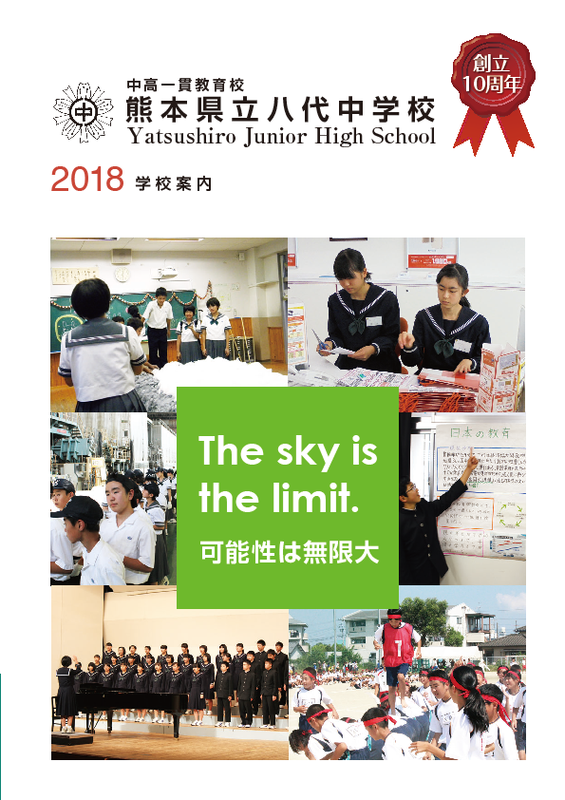 In Yatsushiro SHS, the students who graduate from Yatsushiro Junior High School and the students who graduate from other Junior High Schools are combined in the same classes. They get to know each other during a recreation camp in April. And we also maintain an excellent learning environment for students to work hard together and foster intellectual inspiration. As soon as students enter Yatsushiro SHS, they become seniors at the school. Through a peer-support program and other interaction activities, students develop a sense of responsibility. Being a trusted counselor has many benefits for High School students as well. High School students can cultivate their leadership abilities and a renewed sense of responsibility as they deepen exchanges with juniors in club activities.